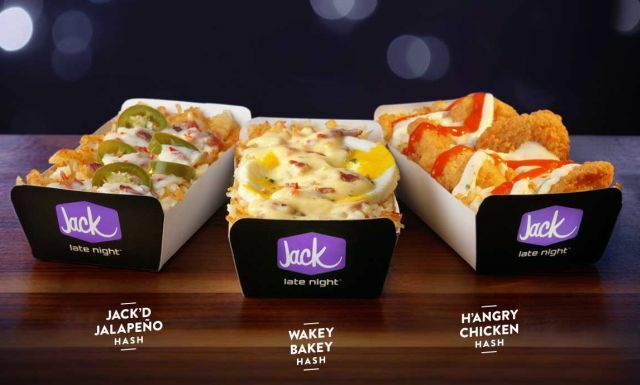 Jack in the Box bolsters their late-night menu with the limited-time addition of a number of new hash dishes that they're calling "Munchie Mash-Ups." While part of the late-night menu, the new trio of menu items is available all-day at $3 a piece. - H'angry Chicken Hash - Chicken nuggets, Frank’s Red Hot Buffalo Sauce, and Ranch are "mashed up" with hash browns and white cheese sauce. 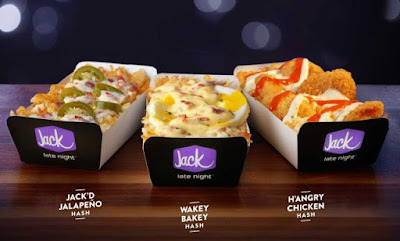 - Jack'd Jalapeno Hash - Hash browns and white cheese sauce are mashed up with jalapenos, bacon, and pepper jack cheese. - Wakey Bakey Hash - Egg, bacon, and pepper jack cheese mashed up with hash browns and white cheese sauce.